Palos Heights Grand Opening Celebration! ANNOUNCEMENT! BRONZEVILLE CHICAGO, IL GRAND OPENING! •WHERE: 17 W. 35th St. Chicago, IL 60616 •WHEN: Saturday, October 3rd @ 3pm Please join us in celebrating our FY Bronzeville Grand Opening at 17 W. 35th St. Chicago, IL 60616! We will be offering the first 50 people in line The Forever Black Card, which earns them FREE YOGURT FOR AN ENTIRE YEAR*! The next 50 people in line will get free froyo on that day! ANNOUNCEMENT! EVANSTON GRAND OPENING! •WHERE: 1739 Sherman Ave • Evanston, IL! •WHEN: Saturday, September 28th, 2013 @ 3 PM! ANNOUNCEMENT! GRAND OPENING! •WHERE: 5 Woodfield Shopping Center • Schaumburg, IL! •WHEN: Saturday, August 17th, 2013 @ 9 AM! Grand Opening in Madison, WI! SPECIAL ANNOUNCEMENT! GRAND OPENING! •WHERE: 506 State Street! •WHEN: Friday, September 7th, 2012 @ 6:00PM! Upcoming Lincoln Park shop featured on Racked! Sally Beauty Supply Being Replaced by Trendy Yogurt Just like what happened a few months ago in Andersonville, Forever Yogurt is moving in and lightening up the neighborhood. FY earns high marks in Madison’s Badger Herald! 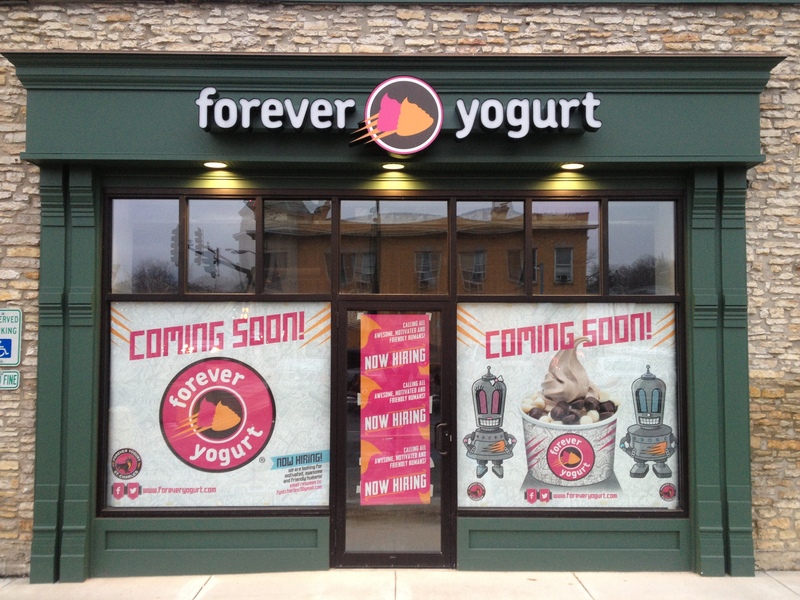 Forever Yogurt throws hat in State Street froyo ring After head shops and cafes, the last thing State Street needs is another frozen yogurt joint. Yet, less than a month before the start of term, Illinois-based Forever Yogurt became the newest addition to campus’ main drag.